Perspective is always a useful thing. And when it comes to changing a date, consider what most of us go through when we decide one day (or week) might be better than another for one of a myriad of reasons, some related not just to the event itself, but the various schedules of those who are critical to its success. In most cases, we’re dealing with one or two people, possibly even a handful if it’s a team or family gathering. And then there’s the North American International Auto Show, arguably one of the biggest in North America and, largely due to it being smack dab in the middle of the automotive capital of the world, one of the most influential. The auto show calendar is a very big deal for more people than one might think, and not just the people who work at the world’s automakers. Add in the people who make the exhibits, transport vehicles from one show to another, and halls—Detroit’s Cobo Center included—and there’s a very complex dance going on every time someone decides to shift something in the lineup. Last year, officials at NAIAS—insiders pronounce it “NAY-AS”—announced they would be doing just that, moving the dates from January, the traditional spot on the calendar, to June. Two things to point out here: one is that it is a big deal; the other is that no one was surprised, given the process those who spend much of the year putting all the pieces together had gone through to make the debut June event, now set for 2020, a target that everyone has now embraced. Our questions—and, by extension, those of our readers—related to how this shift of dates came together and who was involved, essentially the “thought process” that resulted in the “oh yeah, that makes sense” reaction to the July 22, 2018 announcement. We started with Doug North, who chairs the 2020 NAIAS as part of the structure the Detroit Auto Dealers Association, which owns the show, has established. North, who heads North Brothers Ford in Westland, a business that’s been in the North family since its inception in 1928, is also president of the DADA, having gradually moved through the ranks of the 190 dealers who make up the organization. When a dealer moves up to become a vice president of the association, they began travelling to international shows, an opportunity to rub shoulders with others in the auto show circuit, including manufacturers, suppliers and representatives of governments. People like North and Rod Alberts, executive director of the DADA and the auto show, are constantly looking for trends in the industry and ways to better meet the needs of automakers who ultimately will drive what goes on at these events. Anyone who has played chess with a degree of skill or at least awareness of how one move can have a ripple effect throughout a game will appreciate the sense of “big picture” that North, Alberts and others at the DADA and beyond would have to consider should a move of dates come together. Alberts spoke about just how long the thinking took place for the decision that was made. Three years ago, the integration of the technology piece birthed an event that came together when additional space became available as a result of a massive $279 million renovation project for the venue. AutoMobili-D, designed to showcase not only new technology but the startup firms, also serves as an opportunity for conversations to take place between potential venture capitalists and companies who want to carve their own path to a future where autonomous vehicles and the like are commonplace. The recent event grew to 85 startup companies taking space, 35 more than the previous year, blowing past expectations that were set when the event first came together in January 2017. What the success of AutoMobili-D telegraphed to people like North and his dealer colleagues, as well as Alberts, was the appetite for even more engagement, not just with the industry, but the public who were already seeing substantive change in how automakers were bringing their products to market. Alberts points to one of those changes, the “cadence” of introduction that now sees vehicles being introduced not at a set schedule (typically September), but “when they’re ready,” an eye-opener when your business is scheduling opportunities for those unveilings to take place. But back to the idea of a date change for Detroit. A critical checkpoint was how Cobo Center would be—could be—accommodating to a move, and the dance began, with numerous discussions taking place among representatives of the industry who would be affected. And here’s where Alberts began to see the impact that a move to June would begin to take shape. What a June event would offer—or will now that the date change is a given—is a grand opportunity for potential buyers to take test drives with new vehicles in a broad number of situations. In auto show vernacular, the term is “activations” and shows throughout the southern U.S. have seen growing adoption of the “ride and drive” concept where attendees line up—sometimes for a lot longer than they would for an amusement ride—to drive or sit as a passenger in one or more vehicles they hope to buy. “The timing is good for Detroit to get in that mode,” says Alberts, who has certainly seen those activation opportunities grow, especially in his role as a key player with Auto Shows of North America, a subset organization of dealer groups. One obvious opportunity that visitors to the June 2020 event can begin to look forward to is an enclosed Hart Plaza, the 14 acres of open area east of Cobo Center that was—in a winter auto show—a sort of urban desert as far as outdoor activity was concerned. Alberts, whose ongoing job is to create opportunities for automakers to showcase their product, says keeping on top of what various suppliers and tech companies want and need to do to make an ever-vibrant NAIAS take shape will be key. “It’s really about bringing people in and letting them experience the cars,” he adds. 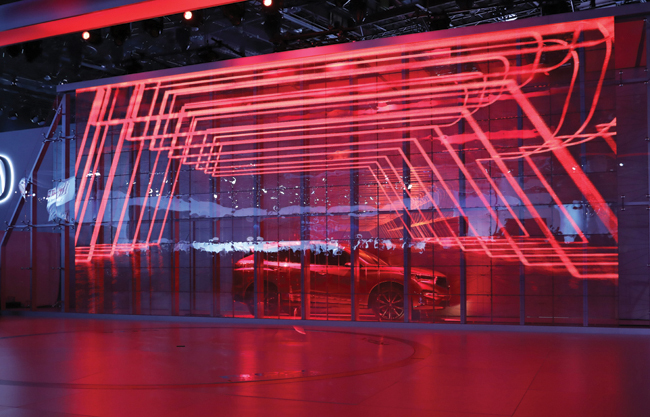 There’s another compelling reason to embrace the move of NAIAS to June and that’s the cost. Setting up a January show typically takes eight weeks, with numerous holidays factoring in to labor costs, which drives up the overall price tag for exhibitors in a time when cost-cutting remains a key factor in a push for profitability. For the June 2020 event, that setup time will be slashed to just three weeks, and two weeks for subsequent shows. That delivers another added benefit from the cost perspective: grandiose displays, some of them even multilevel (Ford has even had an escalator in its space), will have to be scaled down just to keep within the fixed schedule. The public show itself—which in 2018 brought in just over 809,000 paid attendees—will be two days shorter in 2020. All of that is a good thing, says Alberts. Doug North, who takes over as show chair from Bill Golling, the dealer’s rep in that role for January 2019, recalls conversations that began to take place in earnest as recently as when the January 2018 show wrapped up. Even beyond the conversations with automakers and suppliers were the ones that took place among sponsors, a significant economic factor given the positive impact that has had over the years. Again, green lights shone for the date change. What also became clear not long after those conversations with key players took place was that it was June that stood out as the logical landing spot for any shift. With the Detroit Grand Prix schedule factoring into the June 8, 2020 start of NAIAS, the “pros” for a date change were simply overwhelming. Already, now that the 2020 dates are established, the plans are beginning to take shape, at least in the minds of those who will be creating all the opportunities a summer show makes possible. Beyond the representatives of the show, the response from people like Claude Molinari, general manager of Cobo Center, and Larry Alexander, president and CEO of the Detroit Metro Convention & Visitors Bureau, have been positive. “Detroit now has the opportunity to showcase our riverfront and our revitalized downtown during our beautiful summer months and creatively use the exterior of Cobo to launch new products that will transform Detroit into an exciting auto-centric environment,” said Alexander. A June event is expected to set the stage for exhibitors to provide immersive experiences that engage media and consumers alike. Visitors can expect to see vehicle activation sites throughout downtown Detroit, including Hart Plaza but also Detroit RiverWalk, Campus Martius, Woodward Avenue and Grand Circus Park, with spots likely extending beyond the downtown area to historic automotive locations or state parks such as Belle Isle. Perhaps predictably, and certainly essential to the June 2020 event’s success, are comments from automakers that have embraced the date change. Jim Trainor, Hyundai’s director of Hyundai North America, said the company looks forward to the evolution of the show. And Scott Vazin, group vice president and chief communications officer at Toyota Motor North America, echoed many of the positive comments. Rod Alberts is certainly one of those with a positive outlook, especially at the end of a process he said was largely about communication with all those who needed to be brought into the discussion. And, yes, it’s about staying on top of change, something the NAIAS and the dealer group that owns the show have come to appreciate. Previous articleHow do you know if SEO is successful?